He had been keeping me company while I worked, standing on my workbench, but I put him in his shipping box earlier in the week. I was starting to get too attached to him! 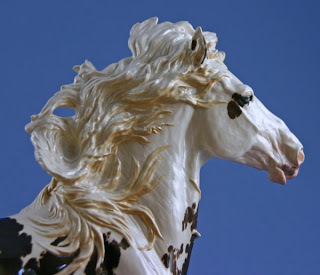 When I hold a lottery, I often get questions about how I get good pictures of the horses even though they are shiny. 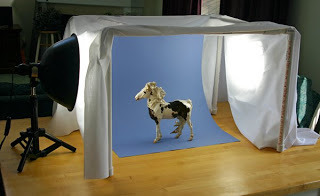 The trick is using a light box. 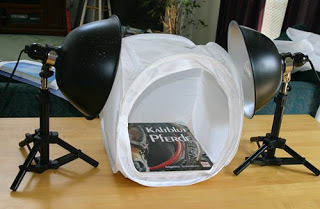 The box diffuses the light from the photo lamps, which helps to cut down on glare from the glaze. 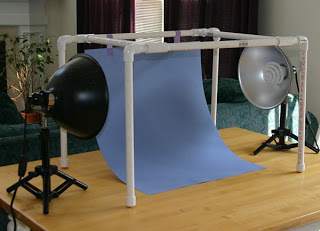 Because most of what I am photographing is small, I normally use a collapsing light cube. This one is a 16″ x 16″. I like it because it collapses flat, so it stores easily in the cabinet below my work table. It’s only real flaw is that lip along the bottom edge. Horse sculptures are best photographed by angling the camera slightly upwards to the area just above the elbow, since this mimics the angle we view real horses. 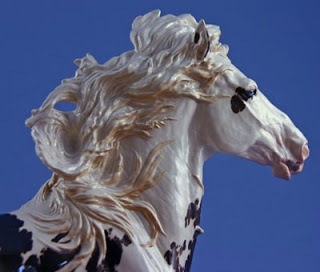 (Nothing will spoil the illusion that this is really a horse like taking picture from above the sculpture!) That lip makes it impossible to get that correct angle. That’s why there is a book on the floor of the cube. It raises the horse high enough to get the right angle. The book also helps stabilize the cube, which can rock a little when the table is bumped. Here is the cube in use. The blue background is just a sheet of colored paper suspended from small plastic clips at the top of the cube. The other end of the paper has been taped to the surface of the book, and the horse is placed on top of it. This gives a continuous one-color background with no horizon line. The cube has worked well, and it’s really convenient, even if it has some design issues. But it only worked for really small models. My new Stormwatch was never going to fit inside it. 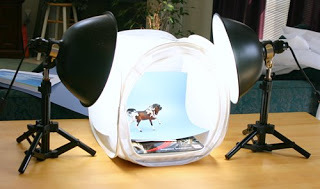 I decided to make a larger do-it-yourself light box. 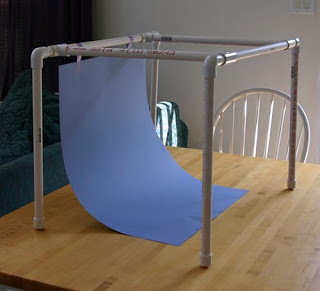 And here is the frame all assembled with the blue paper backdrop. I’ve just suspended the paper from the frame with low-tack masking tape. There’s also a loop of tape under the paper holding it in place on the table. Here I’ve added my photo lamps. I actually had to cut the top pieces of the PVC shorter, so my frame wasn’t so long. I hadn’t taken into account the length of my table, and the room I would need for the lamps. Oops! It could still be narrower to give my lamps more space. And here is the box in use. This time I just draped two yards of white cotton broadcloth over the top and three sides. Eventually I will make nice velcro-tabbed panels from the white fabric, but I wanted to use the box for a while to see if I wanted to adjust the dimensions before I did that. Certainly the box works well enough with just the drape, even if it isn’t the most elegant solution. And here is a photo of my Stormy from the same shoot as the one above. In this particular shot, I pulled one of the lights around a little to get slightly more dramatic shadows on the piece. This sculpture has a lot of neat detail, and I wanted to highlight it. I find that while the light box is helpful for eliminating the worst of the glare, it’s still necessary to play around with the placement of the lights to get the best effect. 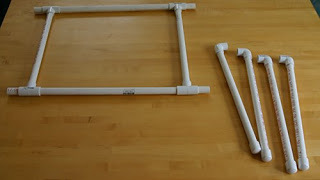 Oh, and if you pick up a few extra T-joints and elbows, there will be enough left over PVC to make two Marshmellow Shooters. 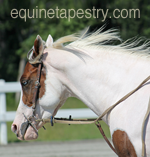 They aren’t particularly useful for getting horses photographed, but they are a great way to get boys out of the house so you can take pictures without interruption!